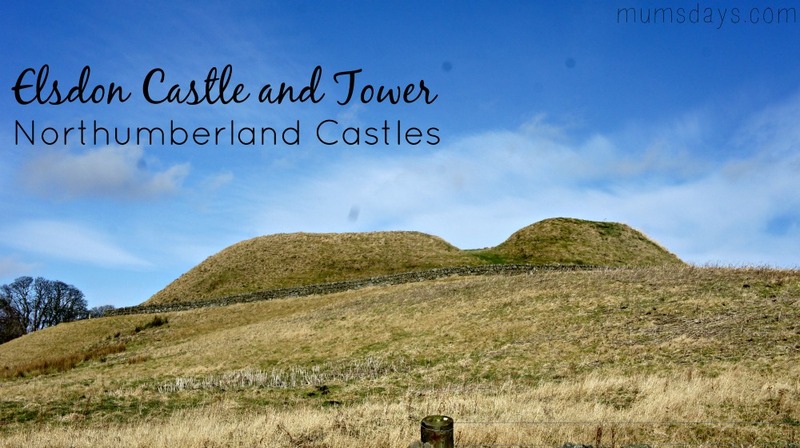 Welcome to another addition of the Northumberland Castles Challenge. 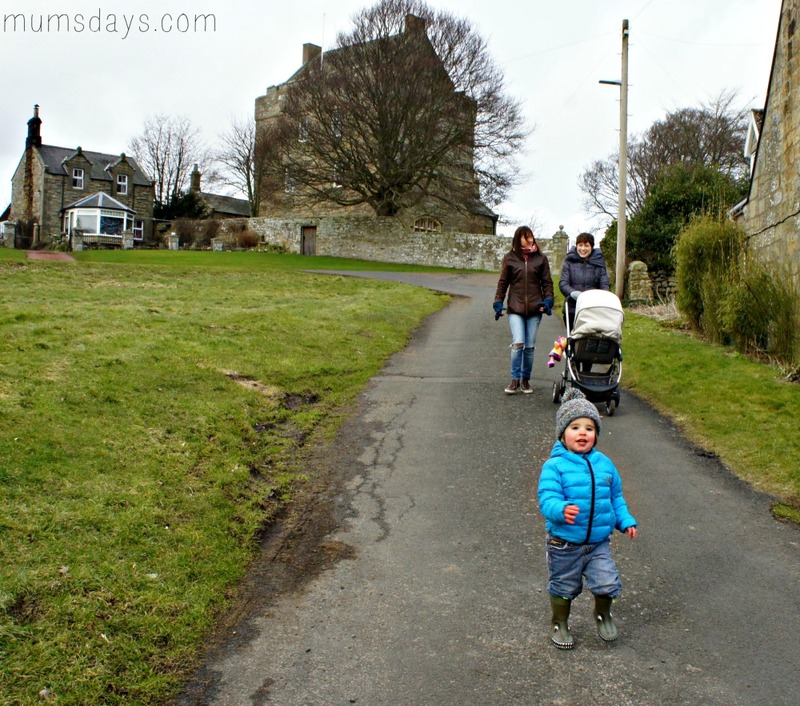 Meet Elsdon Castle! The morning we went to Elsdon Castle was the rush of the century – it always is on castle days but this morning I decided to add to the drama as I had to receive a food shop to arrive between 8 and 9 (I late night purchase because we had no food), make a picnic for everyone, go and get an extra car seat from my in laws (by 9:30 as Michael Senior was off out), then be out the house by 10am to get Emily and Beau from the Airport Metro Station as Emily’s car was being serviced. It was mayhem!! But we made it with time to spare as Beau and Emily were running half an hour late! At least it meant I could fill up with petrol so we didn’t get stranded in the wilds of Northumberland – where on earth is Elsdon anyway?! 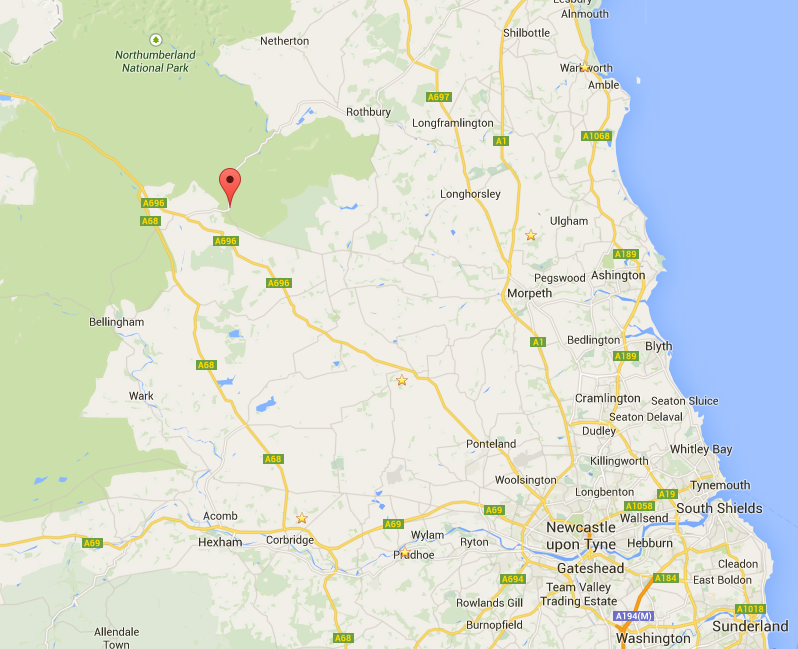 It turned out Elsdon is north of Newcastle Airport along the A696 and guess what? It’s another stunning drive! 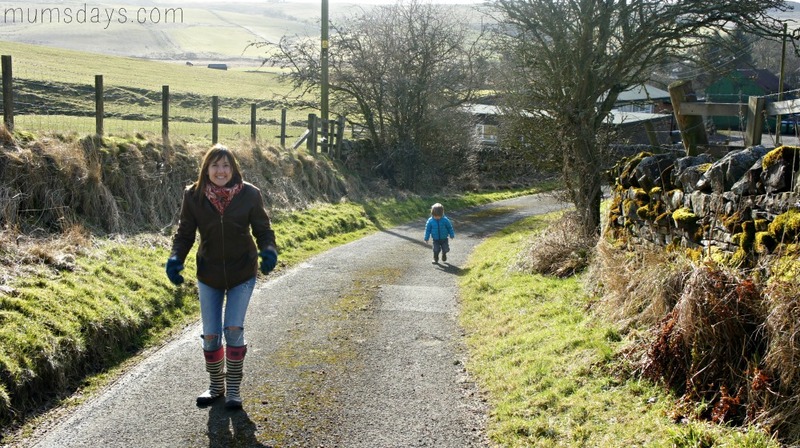 You’re skirting the Northumberland National Park and then dive right into it just as you get to Elsdon. 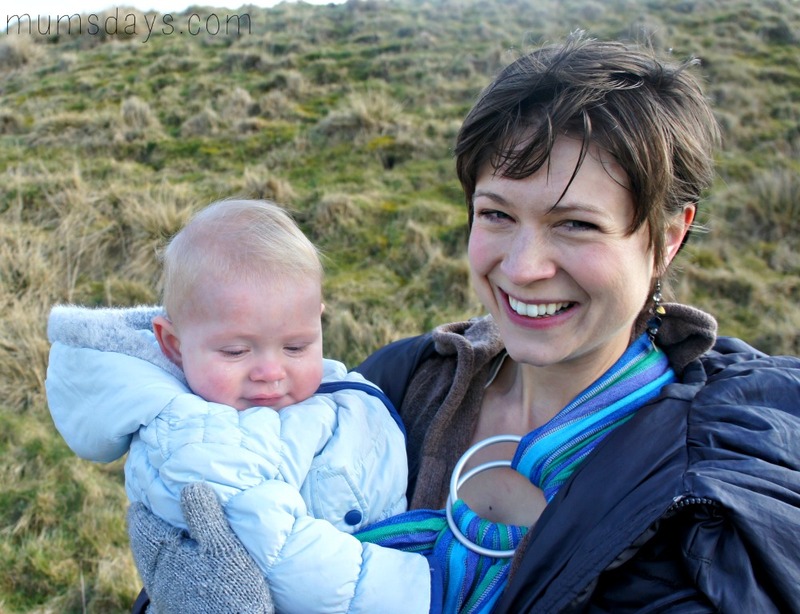 We were also meeting our friend Rachel, who has just started blogging over at Ten Minutes Spare (go and say hello if you have some of those! ), but by some twist of motherly fate, she was also late. 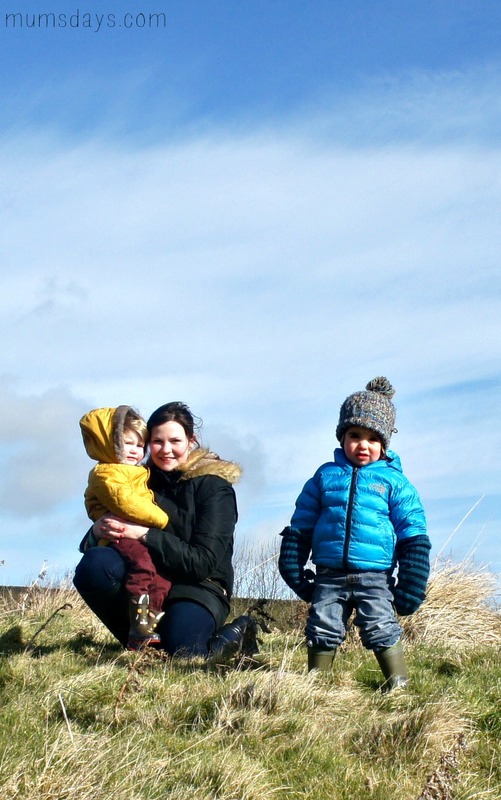 I should explain the level of commitment from my chums though – not only are they traipsing miles away from home (Tynemouth is a good hours drive away from Elsdon, and Emily did half of it on a metro), but they are also bringing children with them – high fives for the commitment! 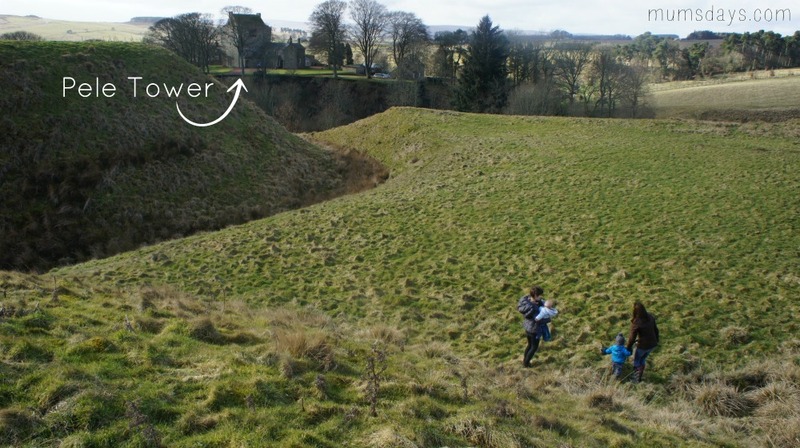 Now, Elsdon Castle is another one of those ‘exploring castles’ – you can’t guarantee what you’re going to find. 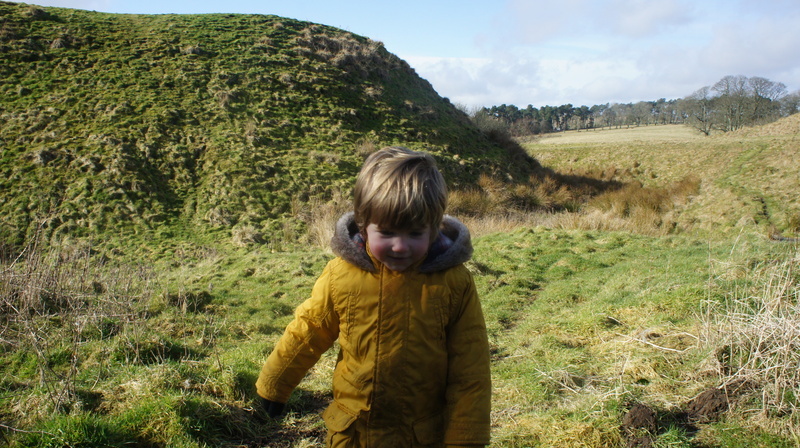 Widdrington Castle was a disaster, and we’ve since had a similar disaster (aka no castle! ), which I shall hopefully write up this week too. 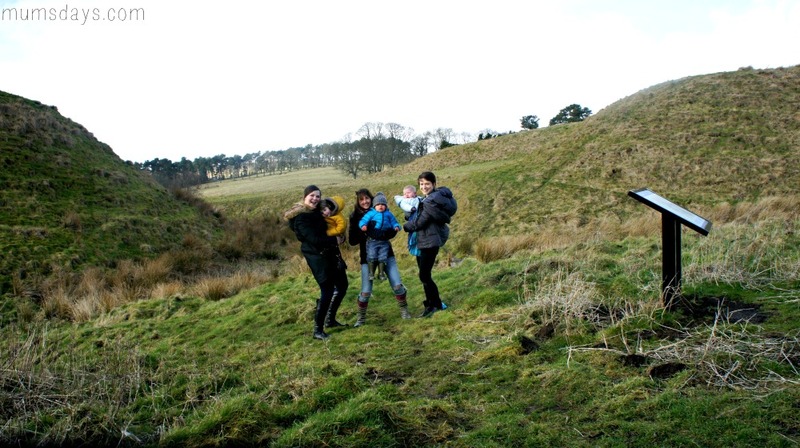 Having said that, Elsdon castle was NOT one of those disasters. IT WAS AWESOME!! 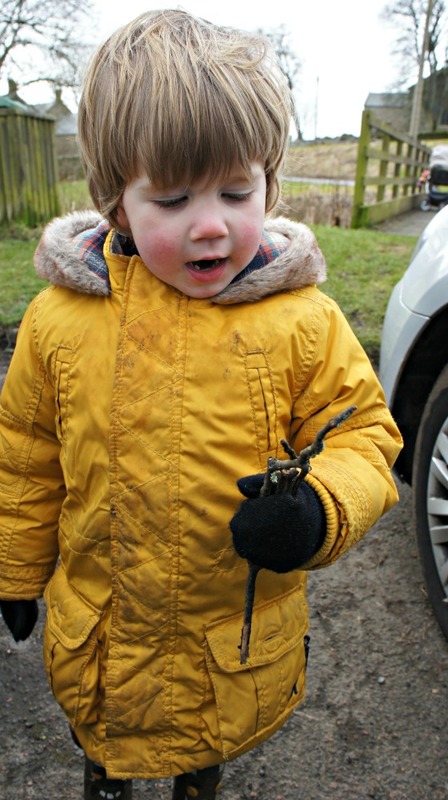 If it hadn’t been so cold it would have been even better. 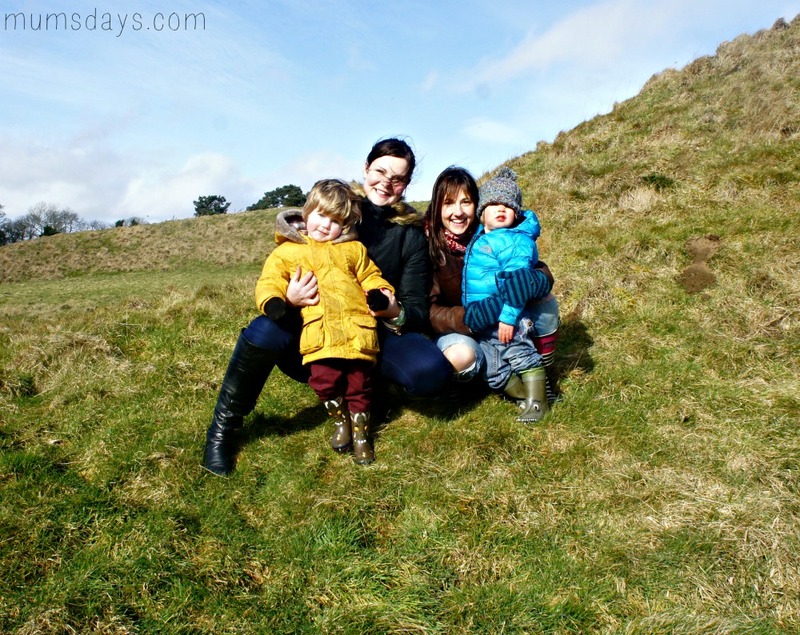 But the sun shone and these are some of my favourite photos of our Castle Challenge so far! Elsdon is a tiny little village with 3 prominent features – OK 4 if you count the farmers motoring about the place on quad bikes and looking at us as if we’d been beamed in from space – a river running smack through the middle of it, a funny looking mound on one side of the river and a funny looking Tower looming over the other side. It was kind of crazy; the normality of people’s washing blowing in a gale whilst these incredible features loom at large. 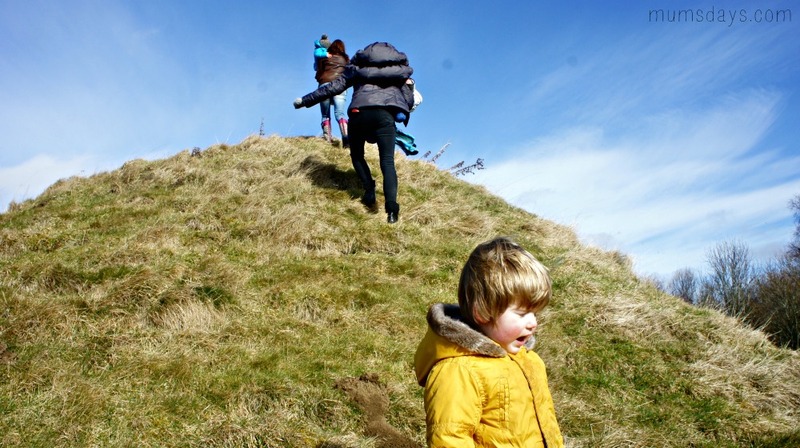 So off we trundled, 3 mums, 2 toddlers and a baby in a buggy, up a dirt track in the vague direction of the mounds. 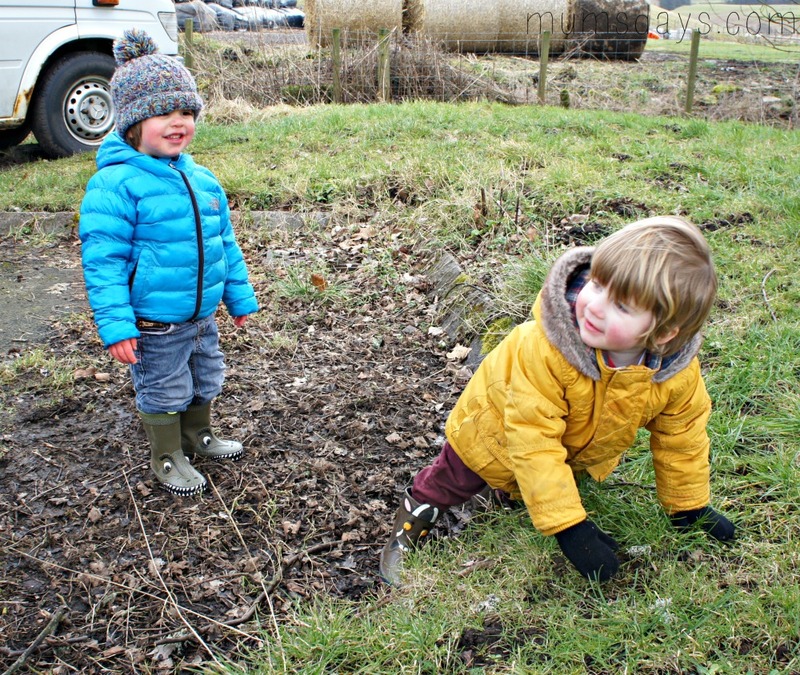 Well, most of us went up, Reuben decided he would run up and then come back, rounding us up like a sheep dog, whilst telling me it was cold. 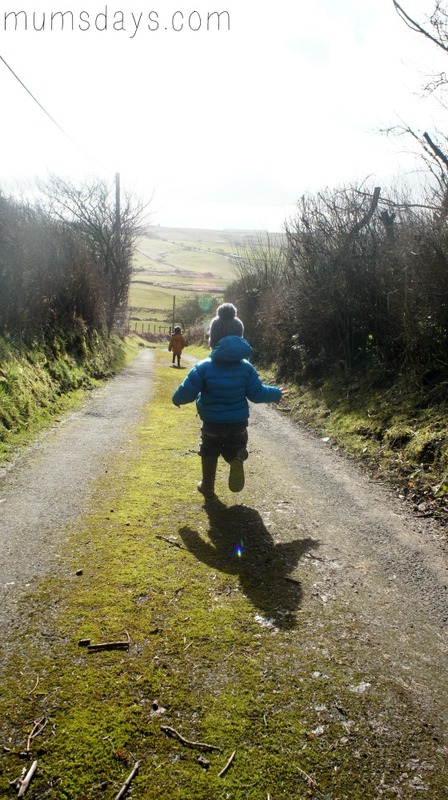 Beau on the other hand likes to take his time and bring up the rear…Emily was just excited to be out in the sunshine! The weather every Friday since we have started this challenge has been seriously rubbish. Then bingo! We reached the right place, so I messed around trying to get shots of the boys in the sunshine while Rachel popped Pumpkin in his baby carrier. The light wasn’t quite right for Reuben’s shot, but I’m very pleased with Beau’s photo (the little fella in Blue if you’re not a regular here!). 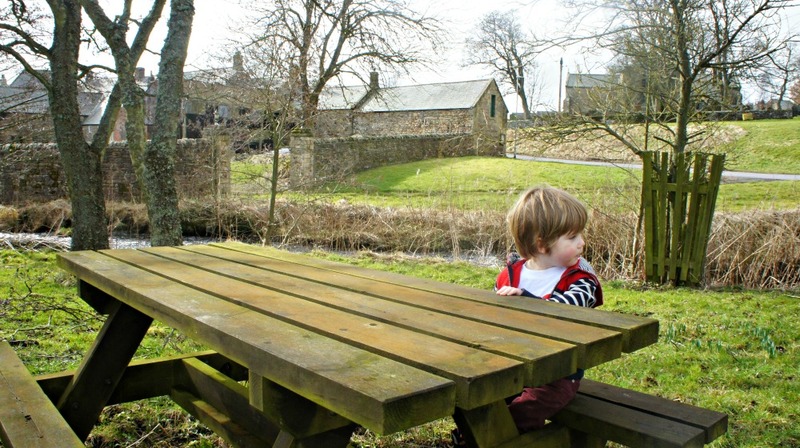 It was built in the early 1100s but abandoned within about 50 years for Harbottle. What a lot of effort for nowt! It is thought to have been built by Robert de Umfraville (who sounds a bit of a sort! 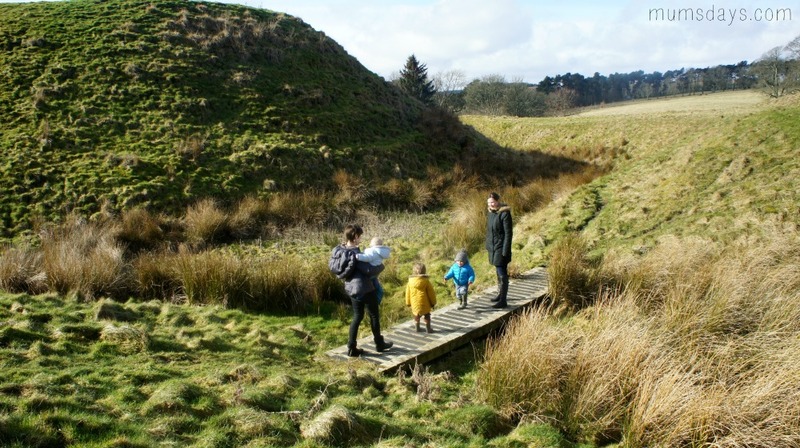 ), a relative of William the Conqueror given special privileges, named Lord of Redesdale, and put in charge of keeping the “wild frontier territory free from wolves and robbers”. Game of thrones anyone?! 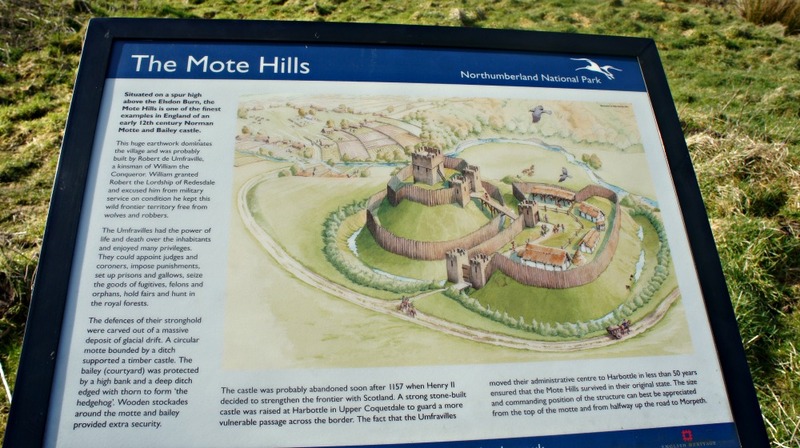 The Motte (a large mound which the castle sat on) and the Bailey (the court yard bit) are completely intact and are steep and large. I couldn’t get it across in the photos just how steep they were. And there is still a little stream running past but not enough to keep intruders out! 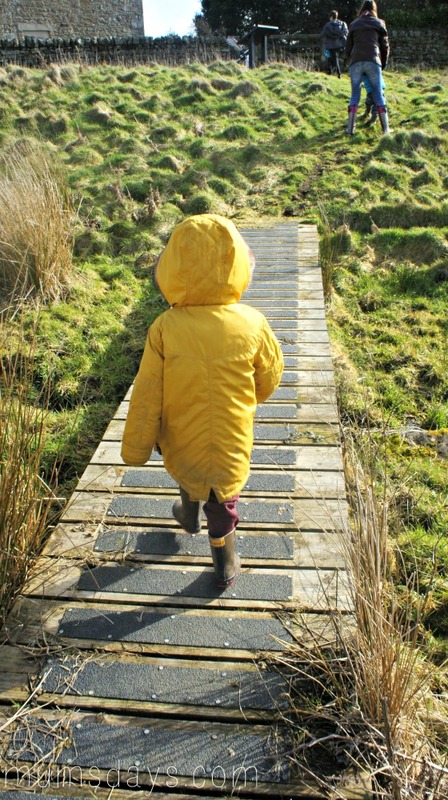 Once we had braved the bridge (Reuben had been reading 3 Billy Goats Gruff, so he wasn’t as keen to cross!) 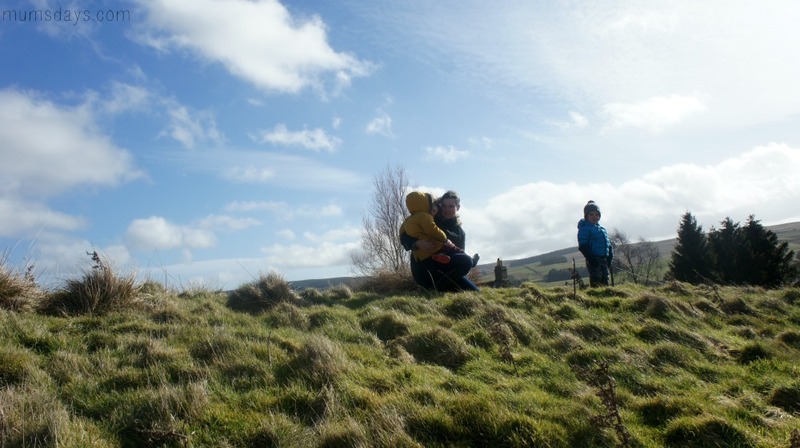 and stopped for a snap in the sunshine we attempted the steep climb with our kiddies. Not only was it really steep but also really windy. So Reuben stopped to protest. I carried him up and he nestled into me once we got to the top. Check out Beau braving the elements though! 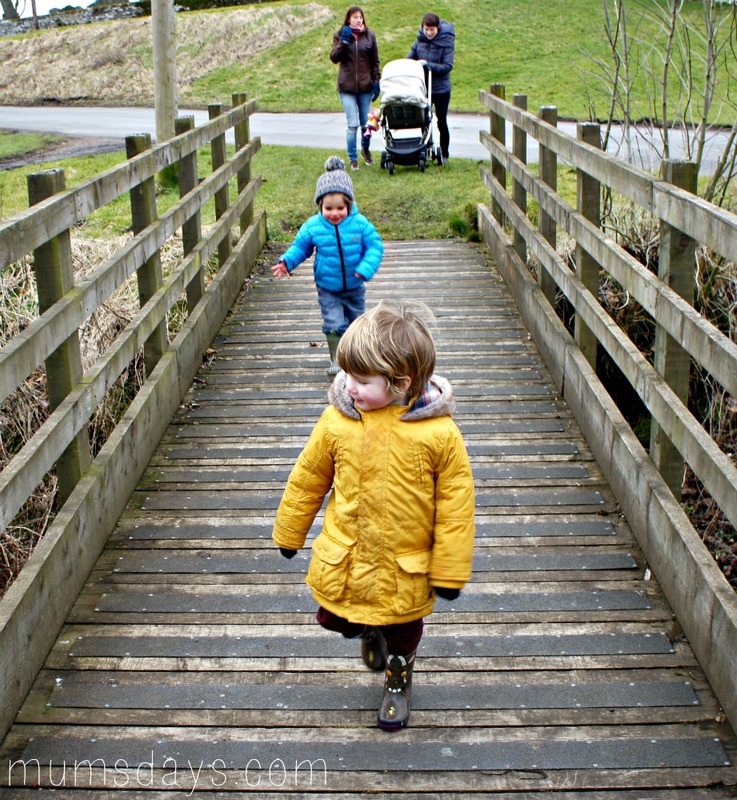 By this point we were all truly windswept and getting hungry, so after a quick snap at the top of the Pele Tower (which I’ll come to), we headed back to the car for our favourite bit… the car picnic! BTW on a less windy day, the ‘court yard’ area would make for an amazing picnic destination. Hills to roll down, beautiful views, history…just perfect! Reuben conquered the bridge on his own this time and even Beau was in front as we went down the hill (they must have been hungry). I LOVE this photo!! 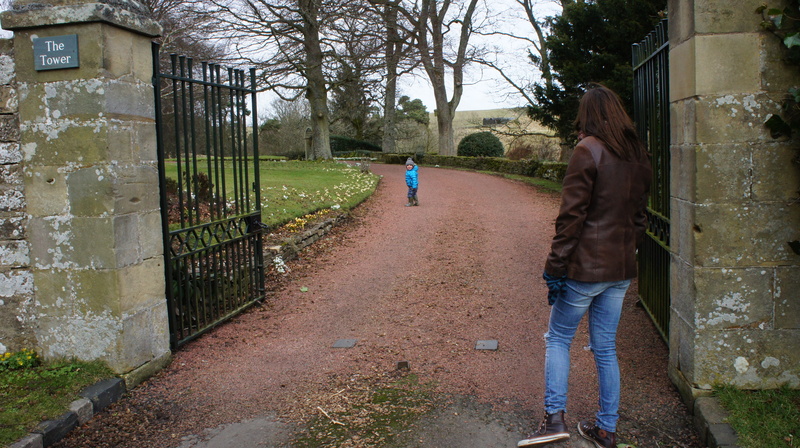 By this point we’d only been in Elsdon about 45 minutes, so we had our picnic in the car, then felt we ought to do a little trip up to the Pele Tower. 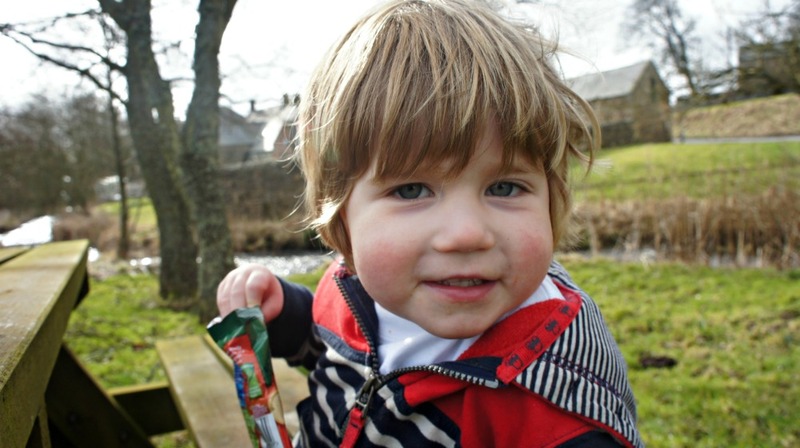 Whilst the others were getting ready, Reuben and I finished our picnic and took a selfie on the park bench by Elsdon Burn. 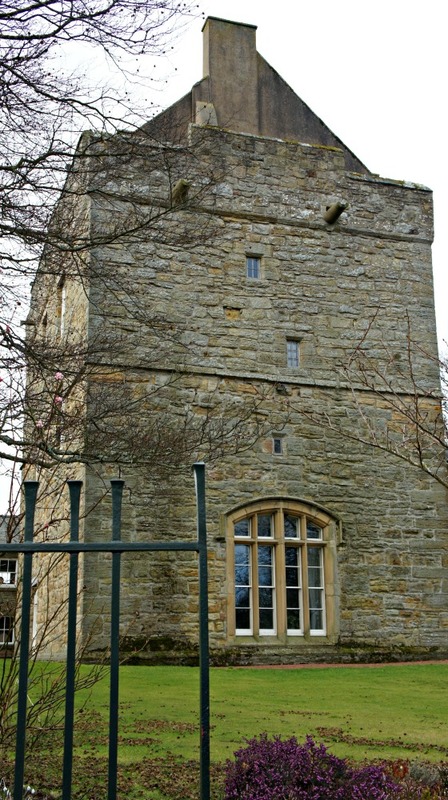 The Pele Tower is a 15th Century Tower which appears to have been built as some sort of fancy, shmancy Vicarage!! It is up a hill, past the church and someone still lives in it! So it is now my dream house. 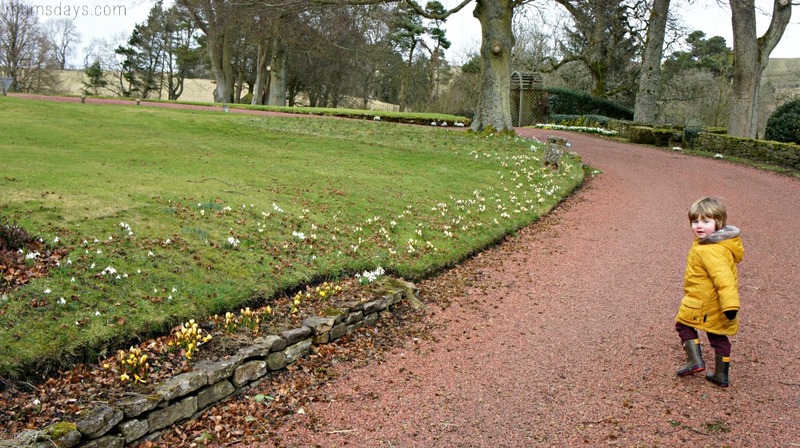 It is also private, so no wondering around the grounds…whoops! 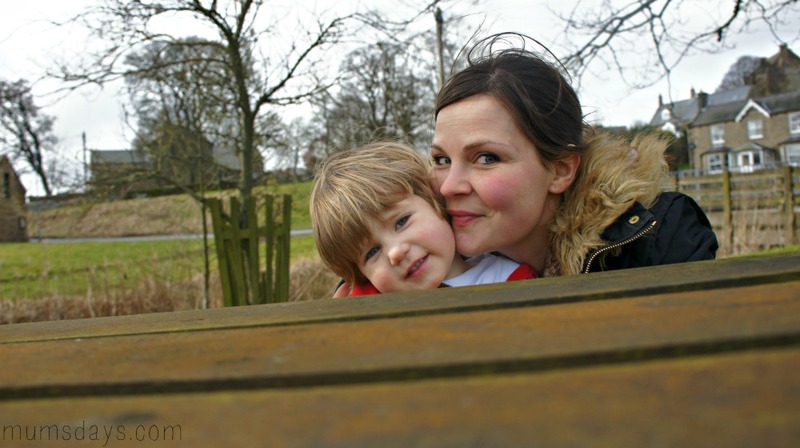 But we did pop our heads in to take a photo and retrieve our toddlers. 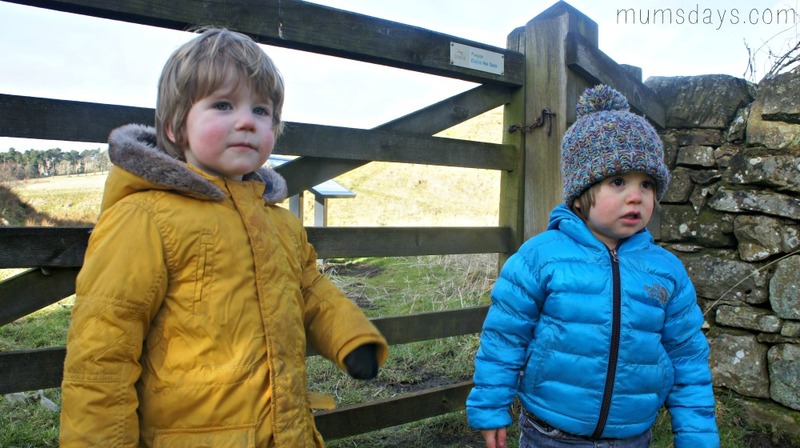 Then everyone suddenly seemed more cheerful as we stomped back down the hill to the warmth of the cars after a little bit of Pooh sticks in Elsdon Burn to use up the last of the boys’ energy. 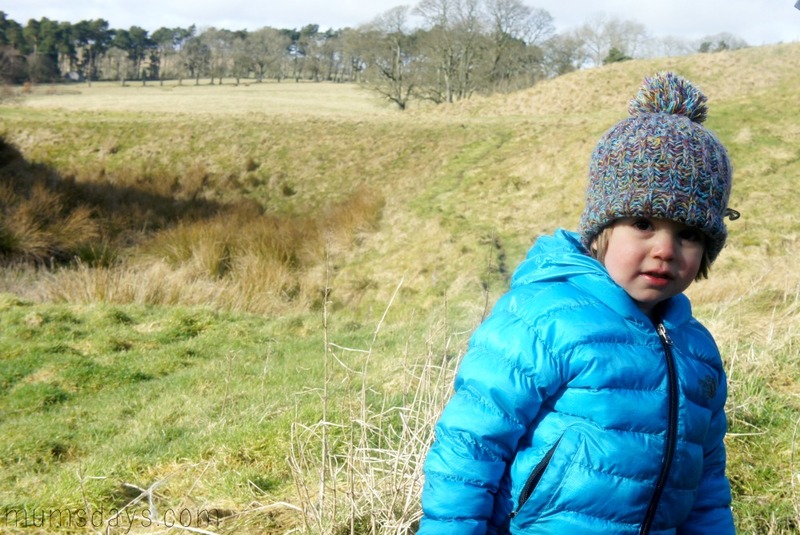 How did Elsdon Castle do? I thought it was a pretty neat trip! 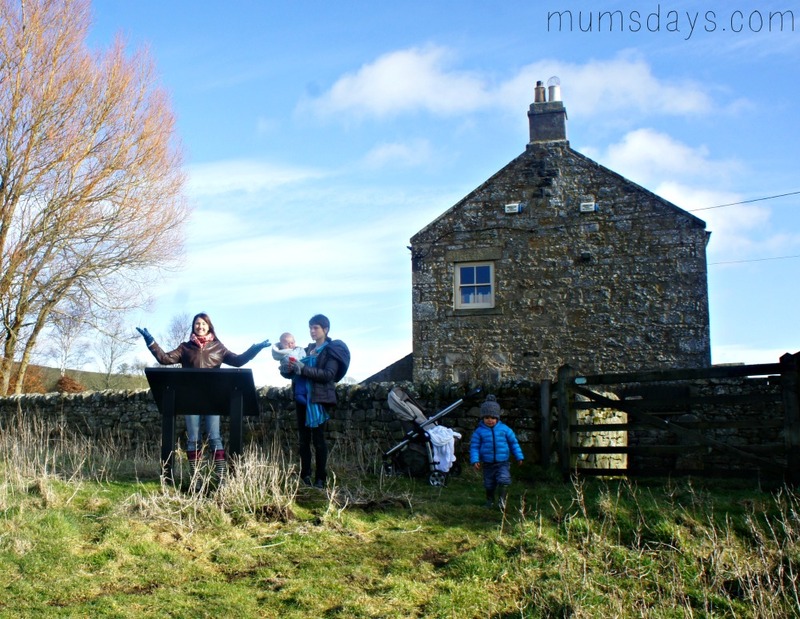 If you enjoyed this or any of the other Castle posts we have been doing, it would be amazing if you could nominate Mums’ Days for the Travel Category of the Bibs Awards – just click the badge and I’ll be forever in your debt! These castle posts are always so inspiring Hannah! I keep saying I’ll look into some near us but I haven’t yet. 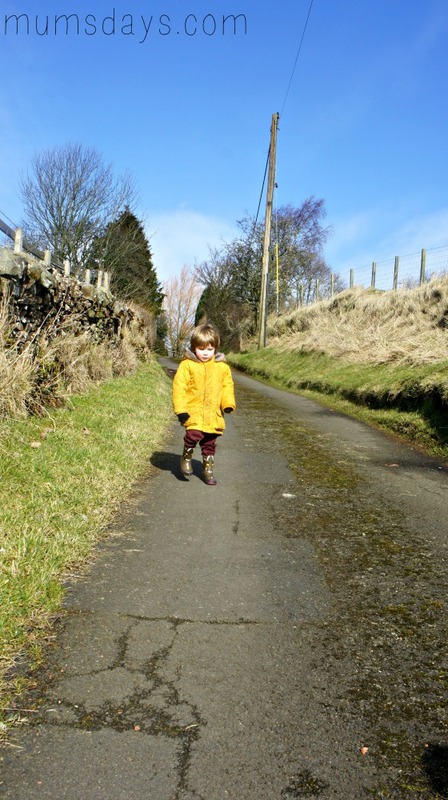 I’m going to sit and have a look this afternoon while Elsa is out with Daddy! Your photos are so stunning too! It looks like you all had a lovely time. What a fab trip out! Beautiful photos…. Looks like a great place to visit, and what a collection of lovely photos! What a fun challenge and a collection of super gorgeous photos! !